Hi guys just a quick question. I got a vamo from you guys a few weeks ago and I just picked up a genesis style tank. Can you tell me if the vamo has short circuit protection? Trying to make my first coil but I don't want to put it on my new device until I am sure it won't blow it up if I screw up. Thanks for any advice you can give! its good to go, I've got a rba on mine as well. make sure it has the gold battery spring just as an extra step. start on low voltage, and make sure the wick is wet. if the wick isn't wet you'll pop the coil real quick. good luck. Helicloud- Do you still have any quesitons about youre vamo? Hi Guys and thanks for the replies! I have since then figured things out though and after drilling out the wick hole and air hole in my AGA T+ I am loving this thing. 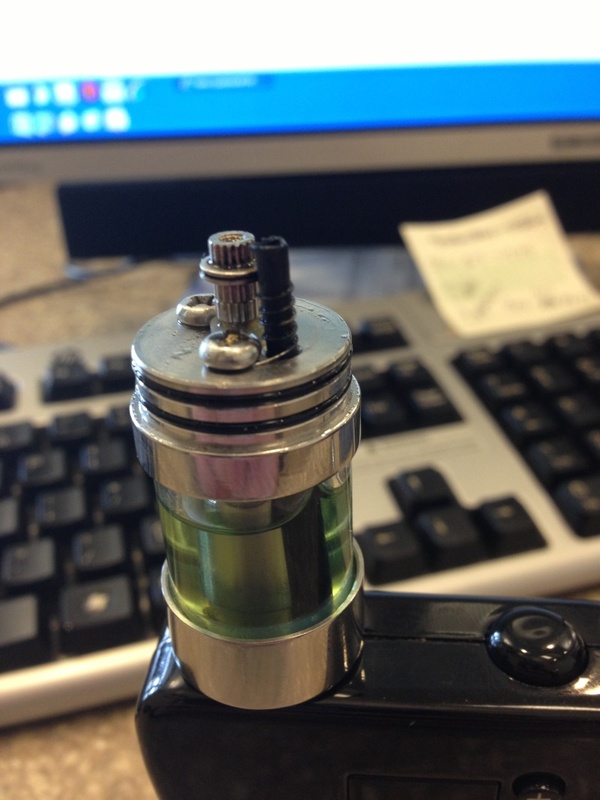 I now use exclusively my mini dojo novas and kanger pro tank during the day while at work. But, as soon as I get home I am using the RBA tank. I had a few problems at first with getting a coil with enough resistance to fire on the vamo. I kept getting the low warning at first. But, after MANY tries I finally wrapped a coil either 5 or 6 times can't remember exactly but it reads 1.9ohms on my vamo and vapes like a champ! I would love to see the dojo start carrying RBAs and supplies. Thanks again guys and happy vaping! Hello Helicloud, we have two part time very experienced vapers working on weekends now. Which is myself Josh and an other guy named Chris, we have alot of experience rebuilding coils, weather it be SS Mesh or Silica. If you ever have any questions about RBAs just give us a shout. VapeMasterSupreme wrote: Hello Helicloud, we have two part time very experienced vapers working on weekends now. Which is myself Josh and an other guy named Chris, we have alot of experience rebuilding coils, weather it be SS Mesh or Silica. If you ever have any questions about RBAs just give us a shout. Hi josh and thanks! I will definitely ask for help if needed you guys are running a great shop there. Do you guys plan on carrying rba's or supplies in the future? Yes actually we are getting the RSSTs in very soon, which is a very awesome beginner RBA, I have a little trick also with that RBA and no oxidizing the wick either, and it fires like a champ! That is awesome! After watching pbusardo's video on the rsst I am very interested. Put me on the list I will be getting one as soon as they are in stock lol. Heres a Pic of my AGA right now on the groove.. Very cool! Here is a pic of mine. With my heli in the background haha hence the name helicloud. Mine is actually starting to taste harsh now all of the sudden and I can't figure out why I have not changed anything. Is it time to take it apart and rebuild? I have only had this coil around 2 weeks. Sorry for the pic best I could get my phone to take. Thanks! Yea I see alot of carbine build up on the coils, try dry firing and working off some of that crud with a pik or something pointy and blow it away. Does it taste like a hot spot or just dirty? Hey man thanks for the fast reply! It is sort of hard to explain for me because I am a newb. But, I don't think it is a hot spot. It is not like it tastes really bad like a hot spot does it is just very harsh. Taste isn't terrible but burns the throat. Sorry not sure how else to explain. So here is a question for ya Josh. You say dry burn it for a minute and scrape some crud off. How is the best way to go about this? I am guessing I have to empty the tank? If so is it ok to empty the old juice into it's original bottle? It is AiV juice I got from you guys and I am sort of poor and don't want to waste it lol. Or is the juice just contaminated now and gonna taste like doo? It shouldnt be contaminated at all, but if you wanna be safer than sorry. Maybe a syringe might help or maybe pouring it into another empty bottle or even a cup and sucking it out then. But yea the only good way to dry fire it is to have no liquid on the wick. Doesnt turning the volts down help out all with the taste? Maybe even knocking it down by .1 or .2 can make a big difference. No I tried turning it down some. I usually am around 10-11 watts and I have tried it every where from there down to about 7w and everywhere in between. Doesn't make much difference. I will take your advice and empty the juice into another cleaned out old bottle I think that is prolly best. I will then try and dry fire and clean the coils. If all else fails I will rebuild completely. I have just been hesitant to take it apart because it was working so well and this is my first good coil. Thanks so much for all of your help I will post back when I try some of your suggestions. When I unwrapped the old coil all kinds of crusty nasty funk fell off. Any idea what causes this and is it preventable? Or is it just the nature of the beast? I so love the genesis rba when it is working well. Thanks!